Without a doubt, my favorite thing about fashion is the puzzle of putting together a great outfit. Choosing just the right disparate parts to come together and form a cohesive whole is always something I’ve enjoyed, all the way back to when I insisted that my mom buy me cowboy boots and a fake fur bomber jacket in kindergarten. Clearly, having the right pieces to mix together has always been important to me, even as a five-year-old. When our friends at AllSaints asked us to style their wares into two different outfits to explore the versatility of the brand’s handbags, I was the first to volunteer for the assignment. 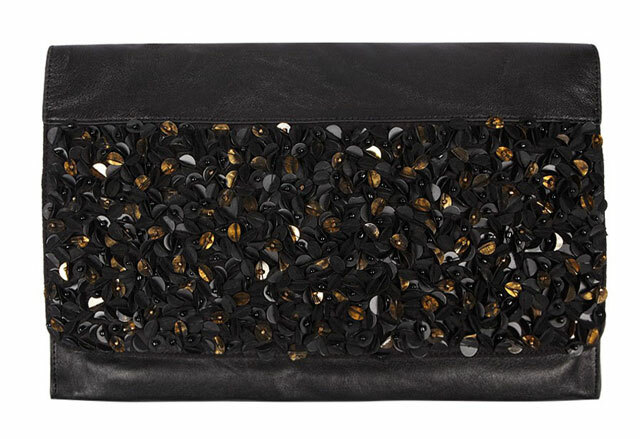 Like we already mentioned, the AllSaints Bolshevik Folio Clutch is just the right combination of versatile and trendy. Buy through AllSaints for $195. 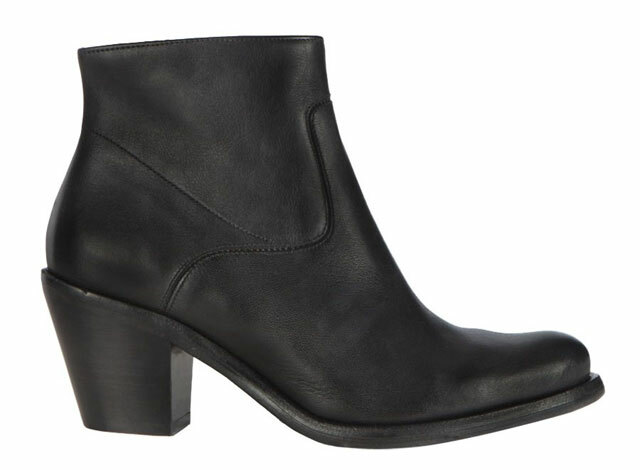 Originally, I planned to pick a different pair of shoes for each outfit, but the AllSaints Hessian Boots just went so well with both the edgy and girly looks. I took it as a sign – these kicks are just as essential as the clutch. Buy through AllSaints for $275. It doesn’t get more classically bad-girl than a perfectly worn-in black leather moto jacket. 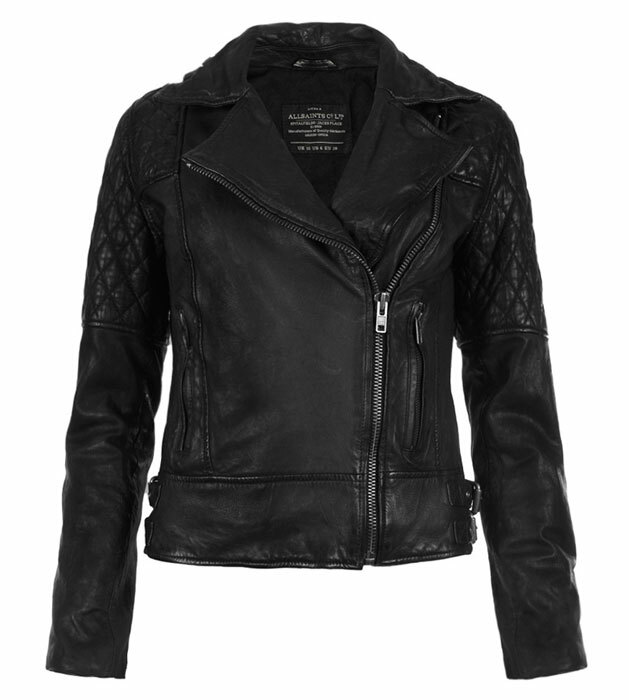 The AllSaints Walker Leather Biker Jacket is a wearable cool-chick archetype. Buy through AllSaints for $575. Successful outfit-building is all about balance; neutral texture on top (like a leather jacket) deserves a complimentary print on bottom. The AllSaints Paradise Leggings are fantastically modern. Buy through AllSaints for $95. Of course, I would never recommend leggings without also recommending an appropriate tunic-length top, like the AllSaints Quartet Gloss Top. Buy through AllSaints for $195. An ensemble with varied textures and prints doesn’t need a ton of extra jewelry, but when you choose an eye-catching element on the bottom (in this case, printed leggings), it’s best to balance it with a bit of extra visual interest up top. 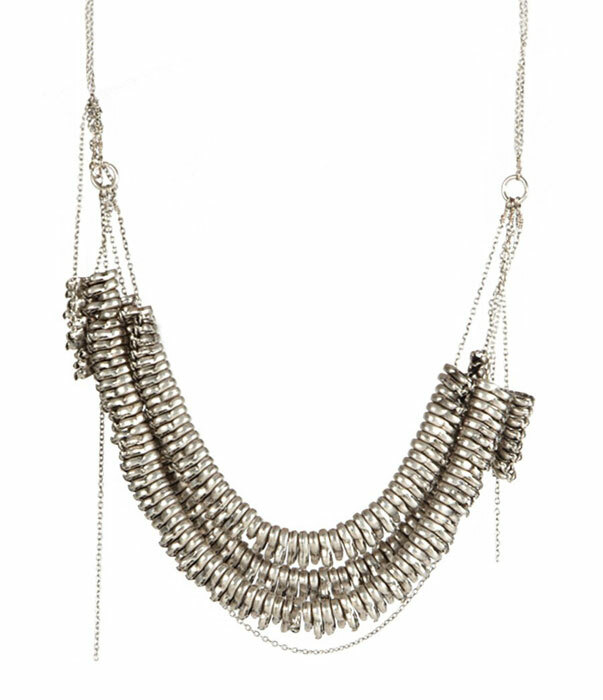 The AllSaints Sabian Matinee Necklace mirrors the industrial-cool feel of the ensemble. Buy through AllSaints for $95. If you think AllSaints’ aesthetic might be too tough for you, think again; the brand’s look is much more adaptable than you’d guess from its leather-and-combat-boots exterior. 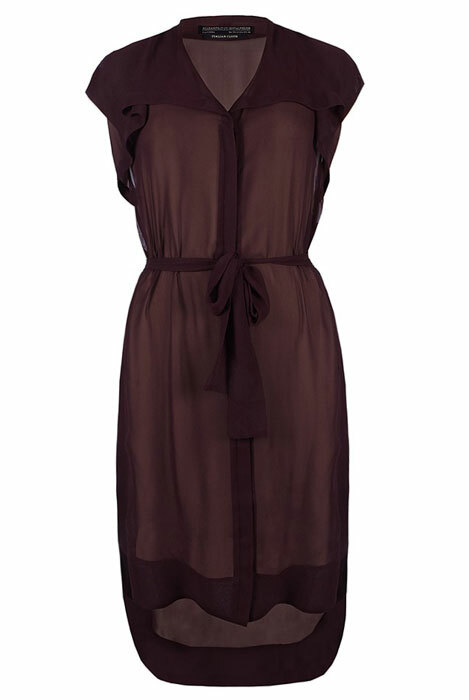 Not only is the AllSaints Hayworth Shirt Dress light and romantic, but it makes a great foundation for a feminine look. 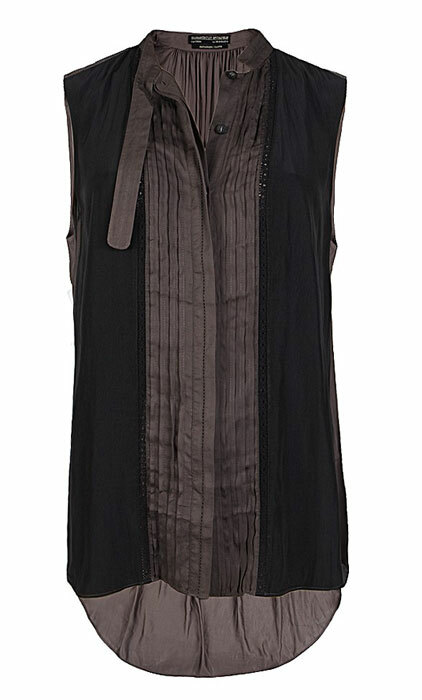 Buy through AllSaints for $225. In my mind, there’s no better contrast for a diaphanous dress in cold weather than that of a plush oversized knit. 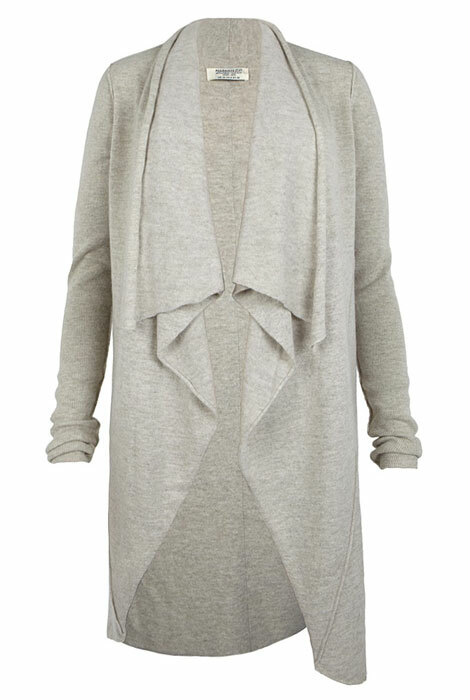 The AllSaints Trail Cardigan fits that bill in spades. Dare I say you’ll wear it all winter? Buy through AllSaints for $175. When dealing with multiple textures and oversized cuts, a good belt is essential. Skip the dress’s self-tie option and go with the AllSaints Fleet Belt, either under or over the sweater. Buy through AllSaints for $65. NO prints and soft textures means the opportunity for lots-o-jewelry. 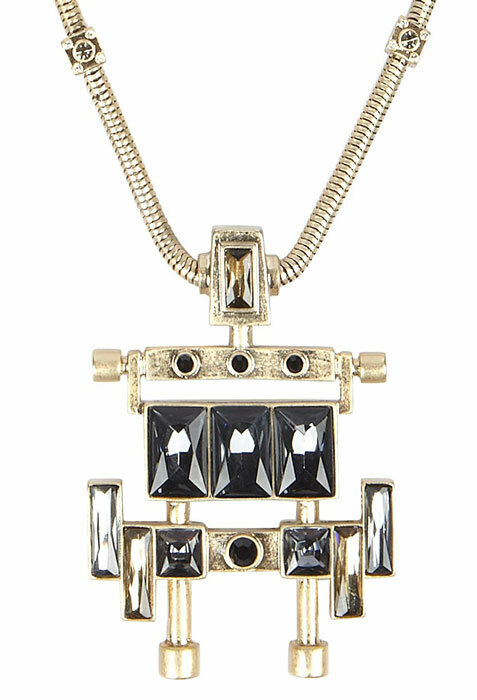 Start with the angular-but-still-pretty AllSaints Teague Pendant Necklace. Buy through AllSaints for $145. A little trick: if you’re wearing an oversized sweater, wear a bangle or bracelet on your dominant wrist to keep your sleeve out of the way for everyday tasks. I normally don’t condone matching jewelry, but the AllSaints Teague Bangle is just too pretty to separate it from the necklace of the same line. Buy through AllSaints for $95.